No matter what model of Samsung Blu-ray player you have, it is not a bad idea to update the firmware on your Blu-ray player from time to time. Nowadays, updating Samsung Blu-ray players can keeps everything in working order, add extra functionality and fix problems with the device’s programming. 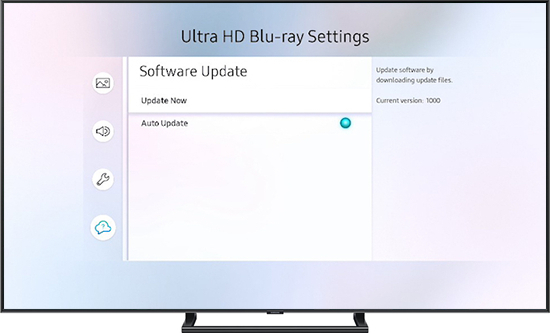 But how to update Samsung Blu-ray player? In this article, we will teach you how to update Blu-ray player. There are three methods available: a Wi-Fi network, a USB flash drive, or a disc with the update files burned to it. How to perform an update for the firmware on a Samsung Blu-ray player? 1. Turn on the Blu-ray player, remove any discs from the device. 2. Do not turn off the Blu-ray player during the firmware update. 1.Press “Menu” >> “Settings”>>”Support” and select “Software Upgrade”. 2.Select “By Internet”.If there is no software available, a message will pop up and indicate that you are running the latest software. Or select”Upgrade Now” to install it. 3.The Blu-ray player will install the upgrade file and restart. 1.Visit the Samsung Download Center. 2.Enter your Blu-ray player model in “Start by Entering Your Product’s Model Number or Name”. 3.Select the right model, click “See all downloads” >>”Firmware”. 4.Click”ZIP” to unzip it on to a USB flash drive. 5.Insert the USB flash drive into the Blu-ray player. 6.Press "Menu" on the remote control. 7.Navigate to Settings >> Support >> Software Update. 8.Select “By USB”and then select Update Now >> OK.
9. The upgrade will begin and a dialog box will indicate the status of the software update installation. 4.Locate the place where you saved the upgrade file, right-click the file and click “Extract Here” to extract the contents of the ZIP file. 5.Burn the ZIP file to a blank disc. 6.Insert the disk into the Blu-ray player. 7.Press “Menu” on the remote control. 8.Navigate to Settings >> Support >> Software Update. 9.Select “By Disc”and then select Update Now >> OK.
10. The upgrade will begin and a dialog box will indicate the status of the software update installation. As Blu-ray provides the best video and audio quality, and it helps a lot after we know the methods of how to update Samsung 3d Blu-ray player. But what should you do when your Blu-ray player’s broken? Currently, streaming is much more convenient. And if you’d rather store those high-quality Blu-ray movies on a PC and play them through something like tablet, iphone, or if you just want to back them up in case of future scratches, you can "rip" them to your computer using a simple program, the Leawo Blu-ray Ripper. Being the best Blu-ray ripper software, Leawo Blu-ray Ripper could rip and convert Blu-ray to video and extract audio off Blu-ray to save in all formats for any media player and device. What’s more, this Blu-ra y DVD ripper software could rip and convert Blu-ray/DVD to 4K video, 1080P video, 720P video and regular video so as to let you fully enjoy Blu-ray/DVD disc on 4K TV, 1080P displays, or mobile devices. One of the most powerful features it has is its ability to rip Blu-ray movies to lossless MKV video. The lossless MKV format this program provides can keep all the original data from your Blu-ray disc in it with no compression and no quality loss. It’s also able to decrypt commercial Blu-ray and DVD discs with copy protection, encryption and region codes. The built-in video editor would allow you to edit the videos freely. You can trim, crop a movie, add watermark on it, adjust video parameters, and even apply 3D effects on a ordinary 2D movie. 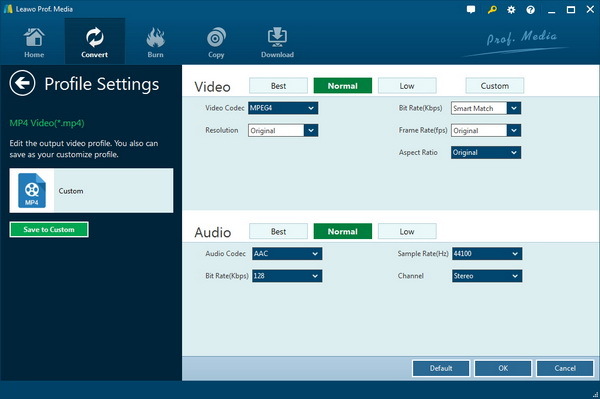 It’s a powerful piece of Blu-ray processing software for people who collect Blu-ray discs. Below it’s how to do it. In order to rip Blu-ray to PC, you’ll need a few things. This Pioneer Blu-ray drive has a slim and compact body which makes carrying it around easy for you. Not only can it read and play Blu-ray discs, it can also burn videos or other files to blank Blu-ray/DVD discs. The disc types it supports include BDXL/BD/DVD/CD. The CyberLink Media Suite 10 Windows software that comes with this Blu-ray drive can be used to play Blu-ray discs on your compute so if you use Windows 8 or above, you won’t need to look for a new Blu-ray player program for playback of Blu-ray discs. It also has the USB3.0 interface which allows for faster data reading and writing speed. It’s a good choice for people who want a compact Blu-ray drive that can be carried around easily. The ASUS BW-16D1X-U Blu-ray drive is a sleek looking drive that pacts powerful features. It works perfectly with Windows and macOS computers and the application of USB3.0 interface gives it fast disc reading and writing speed. The diamond-shaped design that this Blu-ray drive utilizes makes it a unique and distinguishable gadget on your desk. But it’s not made to be carried around. Due to its large size and rectangular shape, it would be impossible for it to be carried around without being a burden. Pioneer BDR-XD05 is one of the most compact Blu-ray drive on the market. It is able to read and write standard Blu-rays, DVDs and CDs, BD-R triple layer, Quad layer, as well as BD-RE triple layer. Moreover, this drive comes with some remarkable and unique features that could really surprise you: its PowerRead mode can make movie playback much smoother regardless of fingerprints or minor surface scratches on a disc, and the PureRead mode can minimize sound glitches by adjusting the drive parameters during music playback. After getting a Blu-ray drive, it’s time to start ripping the Blu-ray disc. Here’s how to do it. 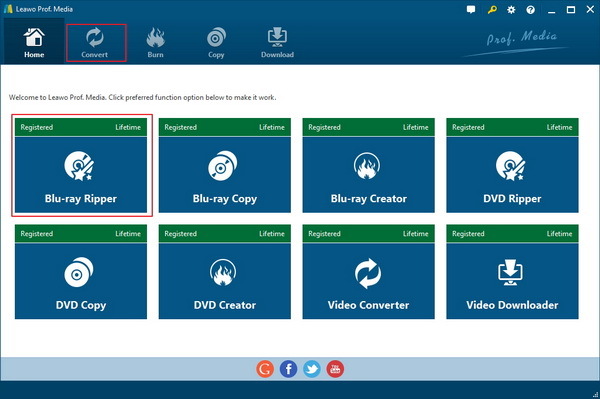 Step 1.Click "Leawo Blu-ray Ripper" to enter the home page, where you need to click "Convert" button on the sub-menu to enter the converting interface. 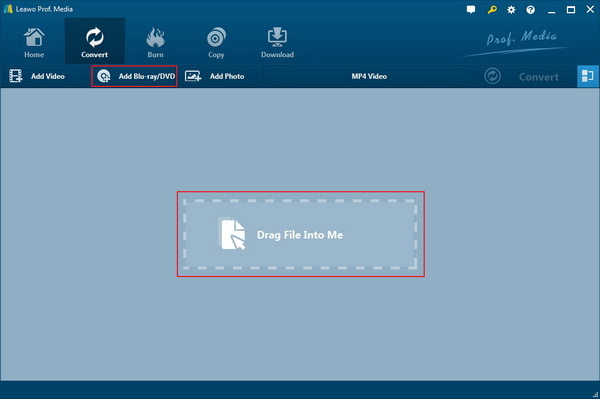 Step 2.Directly drag and drop source Blu-ray files into the converting panel. After the Blu-ray content is selected, you can find three options available for you to import Blu-ray: Full Movie to import all titles, Main Movie to import the longest title by default while the Custom Mode to choose titles for importing. Choose a mode then click "OK". Step 3.Find the MP4 Video button from the menu bar on top of the video list and click on it. And a new menu would pop up with 3 options on it. Click the Change option on the menu to enter the "Profile" panel. You can then choose either video/audio format or profiles designed for mobile device as output profile under "Format" or "Device" tab. The lossless MKV format is called Multi-track MKV in the program which can be found in Format>Lossless Video. Click on the target format and you will be back to the video list and the format you just clicked on has already been set as the default output format. Step 4.Set the AV parameters of selected profile like Video Codec, Bit Rate, Resolution, Frame Rate, Aspect Ratio, Audio Codec, Channel, Sample Rate…in the Profile Settings panel>>”Edit”. Step 5. After profile settings, click on the Convert button in green background to call out a new panel, on which you need to set where you want to save the output video file in in the directory box above. Step 6. Click the "Convert" button at the bottom of sidebar to start conversion process. It will take a while to complete, but once it’s finished, you’ll have a much smaller video file that you can safely store in your PC. Then you can watch them anywhere anytime. Leawo Blu-ray Player is a good program which helps you rip your Blu-ray player. You can also consider it as a tool to help you back up your Blu-ray collection. Physical media carry the risk of being damaged easily so a backup would be necessary if you tend to not pay much attention when handleing a Blu-ray disc during daily usage. 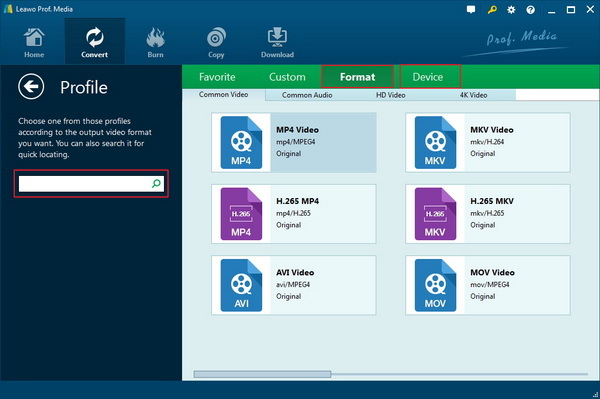 You can utilize the lossless MKV profile to make a lossless MKV video from your Blu-ray collection.